I arrived at Claire’s on Tuesday night. That evening I kept saying to myself I need a photo of the day, but I didn’t know what to photograph – and didn’t want to get up out of my chair to find something. The following day Claire, Terry and I went on a day trip to the Blue Ridge Parkway. They were celebrating their wedding anniversary on this trip – and I got to go along. Because the parkway is full of numerous photo ops, I made up for the lack of a photograph on the previous day. 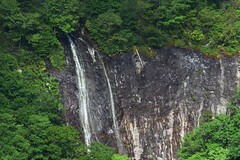 It was a wonderful trip with fairly good weather: partly cloudy which provided interesting cloud cover for photographs. It was crystal clear — no haze — with cool temperatures mostly in the 60’s, and occasionally in the 50’s in the higher elevations. 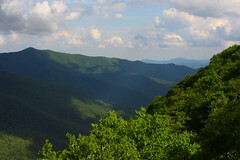 We entered the parkway just north of Mount Mitchell and traveled south. 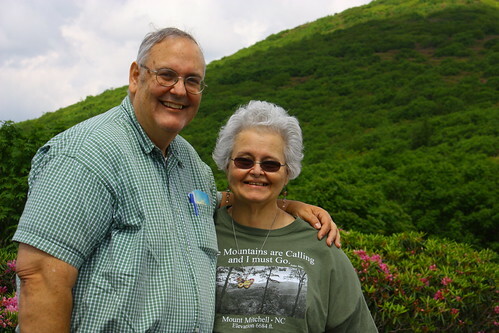 We took a ride into Mount Mitchell and stopped off of various overlooks to take photos. 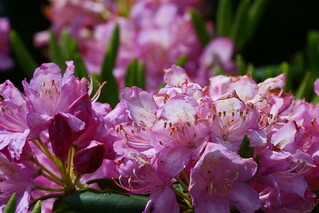 In the spring there are lots of wildflowers in bloom: rhododendrons and flame azalea and other things of which I’m unfamiliar. 365 photo #159 — This is a short path from the Glassmine Falls overlook which goes to a higher level for a better view of the vista. 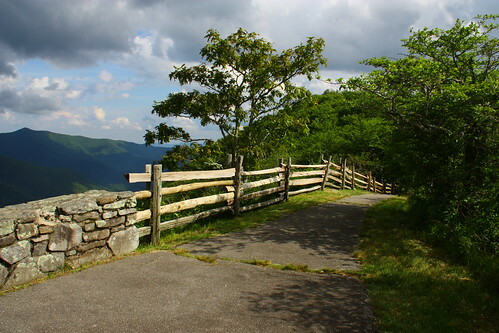 The path is picturesque – and I love the split rail fence. This calls for bonus photos! 1. 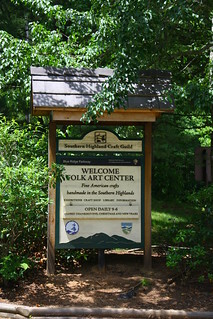 The first thing once we got onto the Parkway was to stop at the Folk Art Center. It’s a wonderful craft shop filled with various artisans from the Blue Ridge Mountain area. I’ve purchased some barrettes for my hair there and wanted some more in different colors, but it was an unsuccessful mission. They did not have any selection. 1. 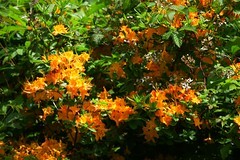 Flame Azalea – gorgeous orange flowering bush! 2. On one of the overlooks (I can’t remember which one now) there is this nearly dead tree. It’s so gnarled and growing in odd directions, probably due to the elements. I also think it’s been hit by lightning several times. The tree reminds me a little of driftwood in a way! 2. Another vista – at Glassmine Falls overlook. The shade from the clouds gave the mountains a tapestry look. 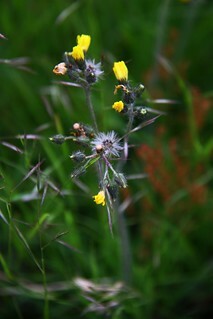 2. an unknown wildflower. Sometimes something so small is so pretty! 1. 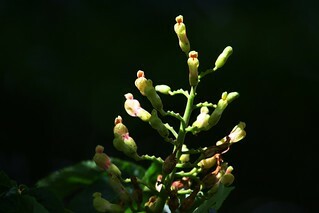 Ohio Buckeye bud. The hummingbirds were swarming around these – and I tried to get a photo, but they are very quick and very small! 2. 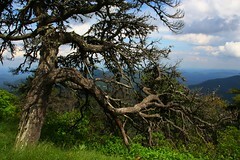 At the glassmine falls overlook there’s this interesting tree that splits not far from the tree trunk’s base. 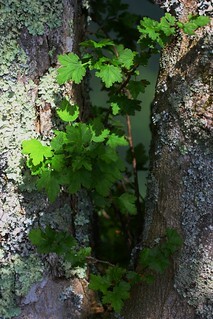 There are leaves growing around the area. 1. 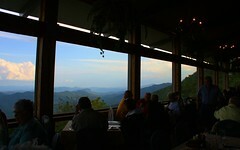 Dinner at Pisgah Inn. The view from the dining room was superb! 2. 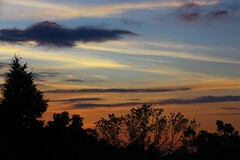 Sunset photo – as we were leaving dinner. From there, as it got dark, we drove the approximately 50 miles to the southern most end of the Parkway, where we got off to make our way home. My friends, Claire and Terry — Happy Anniversary to you!! More catch up photos will be posted in my next entry…. I’m glad you loved the photos, and glad you stopped into my blog to check it out! 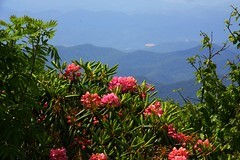 The Blue Ridge Parkway is an easy subject where get great photos. I love my trips there, and wish I was able to go more often. I know I’m way behind, but we were away, and while my iphone got your posts, I didn’t try commenting back because the signal was so weak. What a gorgeous day you had on the Parkway. I’ve never seen it that clear! The photos show it. I especially love the one where the distant mountain ranges look almost like a tapestry. But I love the walkway with the split rail fence, the sunset, and a beautiful one of Terry and Claire. That should be their retirement photo! We were so lucky on the day we chose to go onto the parkway. It wasn’t a cloudless sky, and often we wish for that. However, I much preferred the “partly cloudy” skies which gave a great “tapestry” to the sky — and when the shade and sun were seen on the mountains in the distance – it was a different kind of patchwork quilt type effect. I think what made it so great was that it was so clear and not at all hazy. I love taking photos of Terry and Claire on the parkway. They love being there so much and it shows! It should be their retirement. They hope to go onto the parkway very often! By the way – I like the split rail fence photo, too! « More than half way there….